Even by Chinese standards, the scale of September's natural gas deal with Turkmenistan was significant. 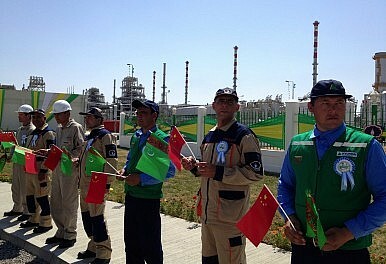 Standing side by side in the oasis city of Mary in the Karakum Desert, Chinese President Xi Jinping and his Turkmen counterpart Gurbanguly Berdymukhamedov marked the completion of the first phase of the world’s second-largest gas field with warm smiles and yet further cooperation. A new deal signed on the same day will see Turkmenistan deliver 65 billion cubic meters of natural gas through the world’s longest pipeline by 2016, an increase of 25 billion cubic meters. The Galkynysh field is “another fine example of bilateral energy cooperation for mutual benefits,” Xi was quoted as saying in the state-run China Daily. In an unprecedented tour also locking in energy deals with Uzbekistan, Kazakhstan, Tajikistan, Kyrgyzstan and Russia, Xi has consolidated Chinese power in Central Asia as Beijing looks to reconfigure its economy based on cleaner, more diversified energy sources amid rising overall demand for fuels. But the impacts are expected to reach much farther and wider than simple economics or within China’s borders. At stake are not only the prosperity of China and Central Asia, but also their respective security, geopolitical dynamics with Russia and the U.S. and the stability of one of China’s most restive provinces: Xinjiang. “There is no energy without politics,” says Dr Avinoam Idan of the Central Asia-Caucasus Institute at John Hopkins University, Washington D.C.
A former Israeli diplomat in Moscow during the break-up of the Soviet Union, Idan says that the relatively recent independence of states in Central Asia is a key factor to remember. “These revenues from energy are so important, not only for their economies but also for their political stability and sovereignty,” he adds. For Turkmenistan, natural gas made up 22.6% of total GDP in 2011, according to the World Bank, second only to Trinidad and Tobago, which has reduced its reliance on gas much more quickly in recent years. Uzbekistan generated just over 15% of its total output from gas the same year, and in 2010 overall energy production accounted for nearly 40% of Kazakhstan’s economy. With China pouring hundreds of billions of dollars of investment into the energy sector in every Central Asian state, these landlocked countries are in turn becoming increasingly dependent on the World’s second-largest economy. China is now the largest trading partner of Turkmenistan ($10.37 billion in 2012) and Kazakhstan (with a target of $40 billion by 2015). It is the second-largest partner of Uzbekistan ($2.875 billion in 2012) and Kyrgyzstan ($5.6 billion in 2012), and the third-largest in the case of tiny Tajikistan. Meanwhile, China’s “dependence on external resources is also increasing, which is expected to reach 50% in five years,” says Liao Na, vice-president of China-based energy consultancy ICIS C1 Energy. For natural gas, Turkmenistan is the key supplier, with Chinese dependence on its increasingly close Central Asian partner tipped to climb from 23.8% of total consumption today to nearly 30% by 2015, adds Liao. And with new pipelines under construction extending and adding to the Turkmen-China line, these economic ties are locked in. “No matter how the regional and global situation changes, developing the Turkmen-Sino relationship will always be the priority of both nations,” Berdymukhamedov told reporters in Ashgabat during Xi’s stop there last month. China is starting to trump Russia when it comes to energy deals in Central Asia by offering better prices and related infrastructure paid for with low-interest loans. But that doesn’t necessarily mean the region is turning away from Moscow, or that the Kremlin and the Communist Party in Beijing don’t have mutual interests when it comes to these former Soviet states, says Idan of the Central Asia-Caucasus Institute.